Ti•tle |’tîtl|: LAW – a right or claim to the ownership of property. 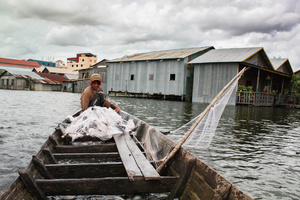 In recent years Cambodia has seen a dramatic increase in land grabs and forced evictions. 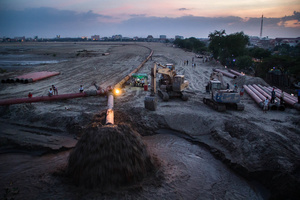 Economic land concessions and development projects have displaced tens of thousands across the country, leaving them homeless and pushing many into poverty. 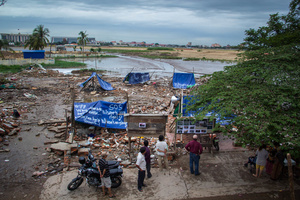 From the start, Phnom Penh’s Boeung Kak development was controversial, and challenged the government to deal with accusations of human rights abuses and corruption. 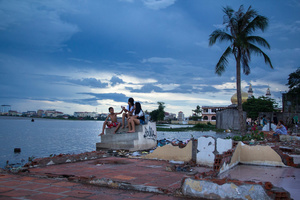 It proved a bone of contention with development agencies, and led the World Bank to freeze all new funding to Cambodia in 2011. 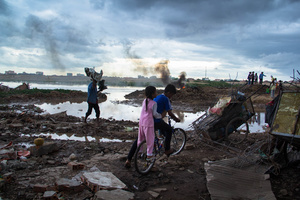 Boeung Kak was the most prominent of the plague of evictions in Cambodia, not least because it displaced more than 3,500 families, a number that led to its description as largest eviction since the Khmer Rouge ordered the capital emptied in 1975. 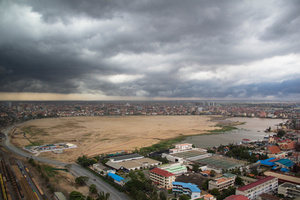 In 2007, a 133-hectare area, including a large natural lake, was granted for commercial and housing development on a US$79 million, 99-year lease to Shukaku Inc.—which is owned by a senator of the ruling Cambodian People’s Party. 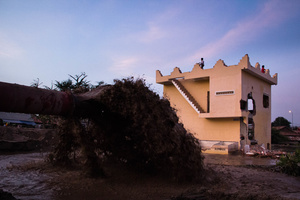 When the company started pumping sand into the lake—without installing a drainage system—thousands of homes flooded, forcing families to leave. 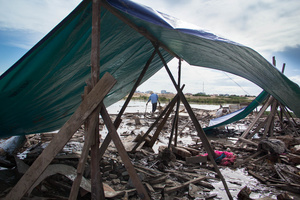 Many were pressured into dismantling their homes in order to get the paltry sum of US$8,500 in compensation. In many cases, families left land on which they had lived for decades. To many, this was grimly familiar, with elderly residents in particular comparing their plight to the darkest days of the Khmer Rouge. 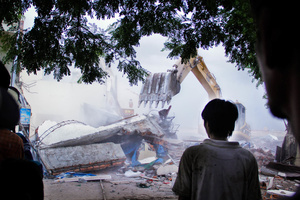 In 2011, company excavators, protected by riot police and local police, demolished eight homes in Boeung Kak’s Village 22. 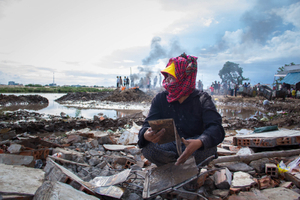 Unarmed, and unable to fight back, residents could only watch as their homes were destroyed one by one. 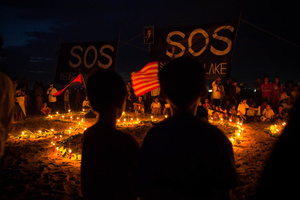 Soung Sorphoan, a former Boeung Kak resident and at the time a leader of the opposition Sam Rainsy Party, encouraged villagers to fight back. 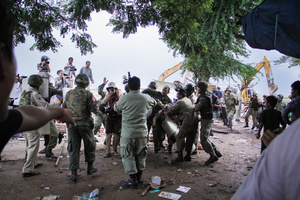 Using rubble, the villagers managed to stop the demolition. Soung Sorphoan, however, was beaten unconscious by police. 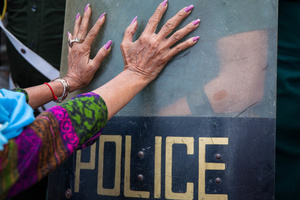 Despite court action, intimidation and the use of violence by authorities, communities around the country are fighting back. 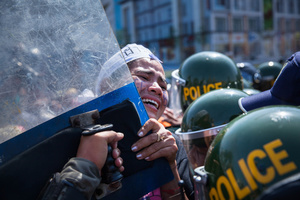 Supported by human rights organizations, demonstrators regularly take to Phnom Penh’s streets to demand solutions. Wary of the consequences if caught, the men support from the shadows as women lead the protests facing the police. Not only has their fundamental right to housing been undermined, but their livelihoods and communities have been shattered. Their cause is not politically driven. 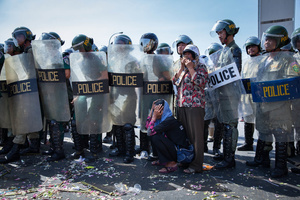 They did not choose to be forcefully evicted, nor did they choose to be away from their families and jobs to fight for their most basic rights. Yet—to many—this struggle has become their daily life. 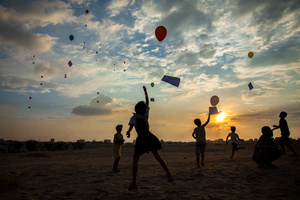 Despite knowing that their actions are unlikely to see their problems resolved, they are determined to continue—pioneers in the truest sense.